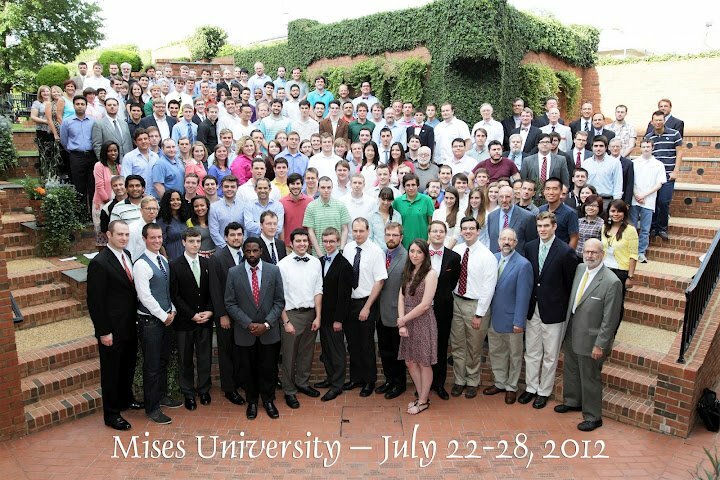 This past week I attended Mises University, a weeklong summer university in economic science. The sessions covered theoretical and applied economics, including epistemology and methodology, pricing, entrepreneurship, comparative economic systems, welfare economics, law and economics, industrial organization, environmental economics, money and banking, political economy, and the history of economic ideas. 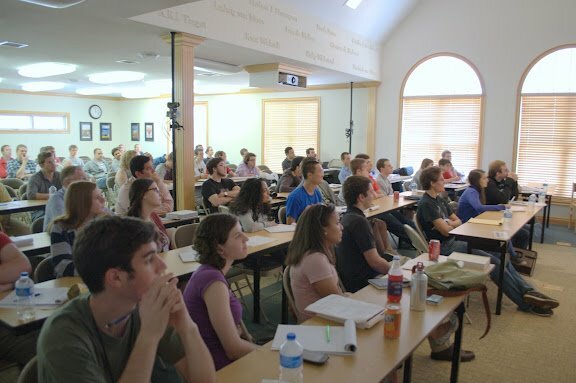 Hosted since 1986 by the Ludwig von Mises Institute, Mises University brings together knowledgeable professors and keen students for a week of immersion in the Austrian School of Economics. I became interested in the Austrian School after attending an Institute for Humane Studies summer seminar last year during which I volunteered to read Leonard Read’s essay “I, Pencil” aloud during an opening session. That week, I also read F.A. Hayek’s essay “The Use of Knowledge in Society“. What was impressed upon my economic views through reading these introductory texts was akin to the influence that reading Plato’s Apology and the Simile of the Cave had on my elementary philosophical views. In both cases, the central message is that there is a need for humility that stems from the recognition of the limits of human knowledge. When confronted with the recognition of his own ignorance, Socrates could have resented the limitations and stopped philosophizing or tried to philosophize beyond his scope of ability, to transcend the limits. But he did not stop and instead realized that insofar as “whatever I do not know, I do not even suppose I know”, he had grasped the beginning of wisdom. What attracted me to Austrian School Economics is its a priorism, that is to say, its beginning with deductive first principles, the most fundamental of which is the action axiom. We begin with a true premise: humans act. Any attempt to refute this axiom would be a contradiction because refutation is an act. I became intrigued with Mises’s magnus opus Human Action, of which I have only read excerpts. Still, what led me to Mises University is the idea of economics not as a “dismal science”, as Thomas Carlyle termed it, but rather a science of human action, and thus a humane discipline intersecting with and relevant to the various liberal arts. Using the Catholic mass app on my iPhone, I walked two miles and found St. Michael the Archangel Church where I attended Sunday mass. To be each week at once in a different church and in the same Church is an awesome thing. It’s also very comforting to find a Catholic church in a new city. It’s like finding a Starbucks. Every Catholic church contains the Blessed Sacrament and every Starbucks has complimentary wifi. So when I ritualistically genuflect in church and order a caramel macchiato at a Starbucks, I never feel too far from home. As I walked through the streets of Auburn, I noticed so much football paraphernalia. Everywhere I went I saw Tigers-themed merchandise. As I peered in a window, someone stopped to say to me, “Football is a religion here.” Every day of Mises University I passed the football stadium, which has a capacity for 87, 451 people. After mass, I went to Waffle House. It was packed. 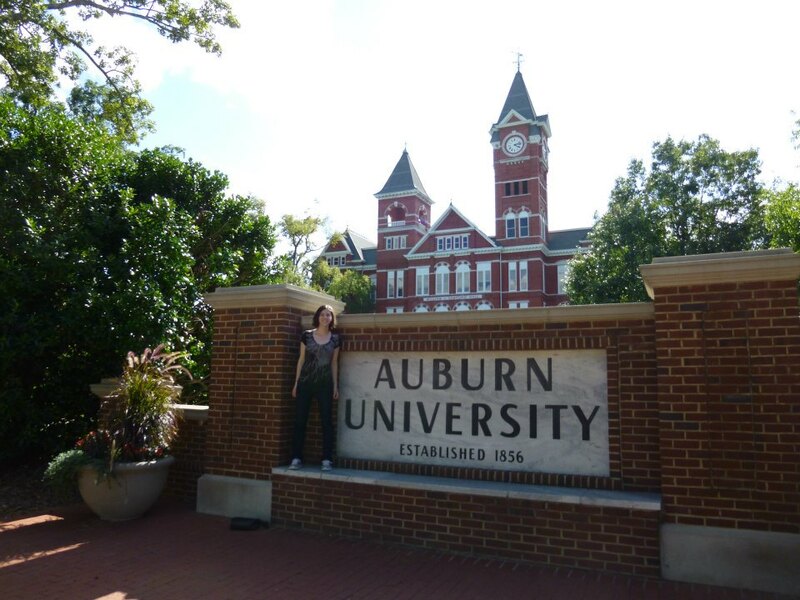 There I met a Chinese student named Sonya who is studying environmental engineering at Auburn. We decided to share a table when one became available and enjoyed one another’s company over brunch. She told me many interesting things about China. Her father works in the civil service granting fishing licenses and her mother is a retired banker. I told her that she is brave to leave her country for her first time to study in America, especially since she is not even returning home for a visit. I asked if she is an only child and she said, “Of course. And every one of my friends is an only child.” Sonya is from Shanghai. I didn’t resist asking her views on the one child policy, which she said she considers understandable given the population of Shanghai. I found this particularly bizarre given that not a minute later she asked me what I thought about animal testing in scientific experiments. She had been shocked to learn of students killing mice in pharmecutical experiments. I cringed when we discussed manipulating human populations, but not mice populations. After saying goodbye to Sonya, I returned back to the Cambridge dormitories at the University of Auburn. Soon after, my roommate Lorraine arrived. She and I decided to go for a walk. Lorraine studies German and History. I was impressed that she too had decided to come to a weeklong intensive seminar on economics, a field outside of her own program of studies. While my summer may seem extraordinary, it is not particularly exceptional relative to the summer adventures of many of the other students I am meeting along the way. It is not uncommon for me to meet people who have attended half a dozen conferences, travelled across the world, studied multiple foreign languages, and who are dedicated, well-rounded, and ambitious people. They inspire me tremendously by raising the standard of excellence. The first night of Mises University kicked off with a lecture by Dr. Robert Higgs titled “Warfare, Welfare, and the State.” Employing lots of religious metaphors to criticize the state, he said at one point, “Even a shepherd keeps his sheep only so that he can shear and kill them.” This was quite a different use of the sheep metaphor than what I had heard in mass that morning. The psalm had been Psalm 23, “The Lord is my shepherd; I shall not want. He maketh me to lie down in green pastures: he leadeth me beside the still waters. […] thy rod and thy staff they comfort me.” Needless to say, I was very struck by how I had heard a similar metaphor to symbolize two very different points in the very same day. 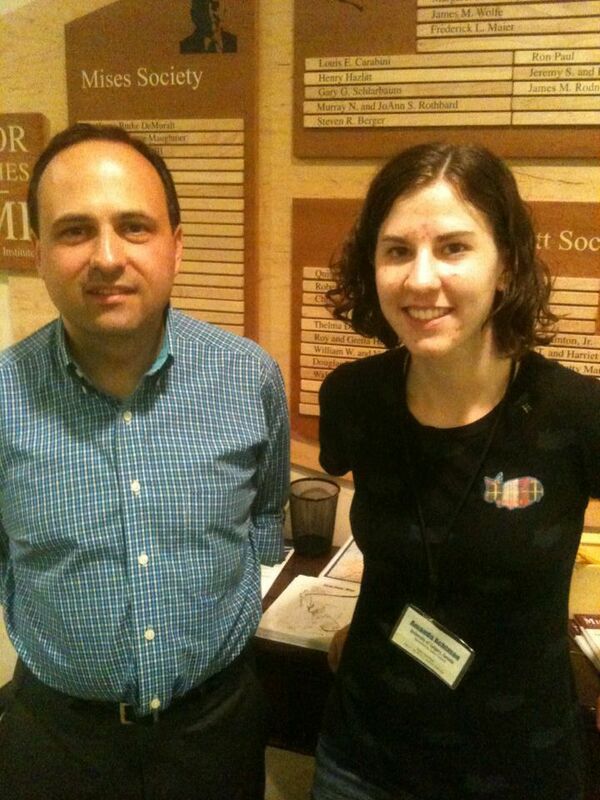 After this talk, I approached Dr. Tom Woods and mentioned what I described above. He told be he had been to mass in the Traditional Rite and so had not thought of it. I asked him what he thinks of Murray Rothbard and how he reconciles Rothbardian views on such things as children and rights with his Catholic faith. Woods told me that he had met Rothbard and said that Rothbard was changing his positions later in life, becoming more conservative, and that he even considered joining the Catholic Church. Woods insisted that one should not “throw the baby out with the bath water” when it comes to thinkers who hold inconsistent or even highly objectionable views. On Monday morning Dr. Joseph Salerno gave an excellent lecture on “The Birth of the Austrian School”. He explained that there were two dominant theories in classical economics: cost determined by production and cost determined by scarcity. The key problem with these theories is that they failed to account for human want. Carl Menger, the father of the Austrian school, contested the cost-of-production theories of value and pioneered the theory of marginal utility and economic analysis centred around the idea that value truly lies in ability to satisfy for human wants. Dr. Salerno pointed out that when we say about a person, even a small child: “he knows what he wants” or “she knows what she wants”, we have a budding entrepreneur. Good entrepreneurship is the ability to successfully predict future wants and often develops from an individual considering his or her own wants and extending those to others and to the future. The next lecture was delivered by Dr. David Gordon. He explained that Mises thought that economics could contribute to the field of epistemology. People are purposive. Every actor uses means to achieve ends. Gordon told us that Mises defined action as involving “felt dissastifcation.” You act because you want to change things for the better. All actions involve choice. After this lecture, I had lunch with a student named Darren who just completed his bachelors degree in the United Kingdom. And it so happens that he wrote his undergraduate dissertation on praxeology, relying primarily on the work of Ludwig von Mises and other Austrians. Over lunch we aimed to distinguish between actions and instincts, correlating means and ends with purposive action and causes and effects with instincts and teleology in nature. We discussed whether nature is causal or purposive and whether rationality is implicit in human action. We also confronted the challenge of discerning the point at which a person begins to act. Other lectures throughout the day were on the topics of: subjective value and market prices, the division of labour and social order, and Austrian capital theory. During the afternoon I overheard David Gordon recommending an Eric Voegelin book to a student. Afterward, I asked him about it and he began to tell me stories about Voegelin, whom he knew personally. I enjoyed listening to him and when he asked how I had heard of Voegelin, I told him that I have taken classes with Barry Cooper, whose name he recognized, although he has not met him. Voegelin keeps coming up throughout my travels this summer, enticing me to immanetize my reading of his six-volume Order and History. relationship with the Austrian School. Voegelin was invited to seminars hosted by Mises that he attended with F.A. Hayek and other students. Voegelin would have been about nineteen years old. It struck me that, while Voegelin took an interest in the economic ideas within the developing Austrian School tradition, he found the focus to be somewhat narrow. Austrian Economics was not accounting for complexities factoring into the realities of human action that Voegelin considered essential to understanding the political order. As mentioned above, it struck me that Voegelin took such an interest in economic ideas but found them to be lacking important dimensions. It also struck me that Voegelin stayed in touch with his friends from Mises’s seminars. As I attend seminars hosted by the Mises Institute and read books by Voegelin and visit with people who knew him, I am starting to see more and more what it means for there to be a tradition of scholarship and how much politics and political philosophy has to do with friendship. I recall a conversation I had during a meal with my friend Ross who I had met at a Liberty Fund seminar. Ross said, “I am tired of discussions where man is considered solely as human capital. I am a man!” he declared light-heartedly, yet sincerely and pounding his fist theatrically on the table. 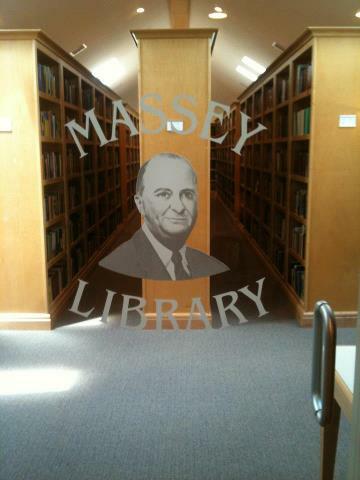 And so I would sneak up to the Massey Library at the Mises Institute to read excerpts from Voegelin’s Order and History. A few paragraphs was a sufficient dose to enrich the Mises sessions with a broader perspective rooted in philosophical anthropology. I read the line: “Government is an essay in world creation.” Throughout the week I reflected on this single line the most. I found myself again asking: In what way are we made in God’s image and reflecting on the human experience of tension between being co-creators and sub-creators. Spending the week with anarchists who consider government both unnecessary and evil, I reflected on the extent to which government is an attempt to imitate the divine ordering of the cosmos. It’s a poor imitation, counterfeit even, but it strives toward a resemblance. What we see in governments is plenty of ‘speculative confidence’ without the restraint that should follow from a recognition of limits. The Catholic vision of the state underscores the legitimacy and limits of government authority. From the standpoint of Catholic doctrine, the authority of governments is derived from the divine and natural law. But the same state is subject to the demands of revealed and natural truth: the state is neither the source of truth nor is it above the truth. 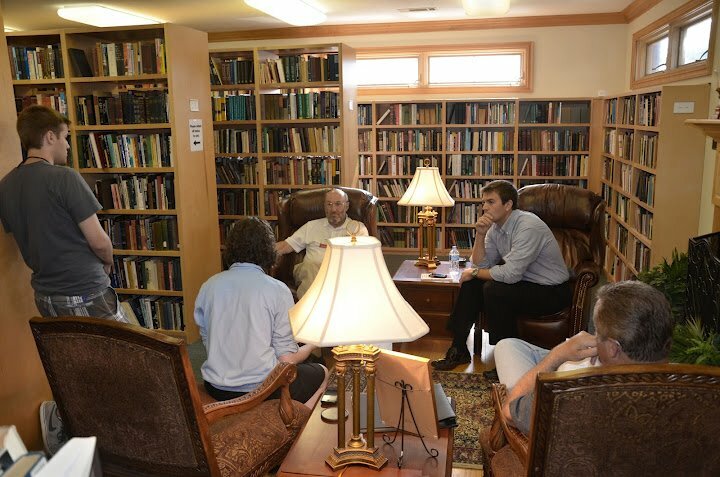 On Tuesday, Walter Block offered a lecture titled “An Austrian Critique of Mainstream Economics”. Block is a well-known Austrian scholar and anarcho-capitalist. He worked at the Fraser Institute in Canada for many years. He follows Rothbard in many respects, but differs from him in some important ways too. Block describes himself as a devout atheist. He began his lecture with an overview of praxeology saying, “We don’t test things; we illustrate them.” Block was “converted” to libertarianism after attending a lecture by Ayn Rand and to anarcho-capitalism after attending a lecture by Murray Rothbard. Since many thinkers count meetings with key thinkers in their day among the most influential moments of their intellectual and personal development, I made sure I had a few conversations with professors one-on-one or with a couple of other students. One afternoon I had a conversation with Block. We discussed Catholicism, libertarianism, the divine right of kings, self-ownership, abortion, and ordered liberty. Discussing ordered liberty, Block asked the question that he is known for asking and that seems to be the primary measure of his judgment: “Are they real libertarians?” He had asked this to me after I had told him about the Acton Institute. “What are they adding to liberty with this order business?” he asked skeptically. I explained that they are interested in promoting a free society and also discerning how to live out that freedom in accordance with truth. “But what if I don’t want truth? I like falsehood. Two plus two is five,” challenged Block. Block had stately clearly that libertarianism is not a philosophy of life. All that it tells you is to avoid harming others. It doesn’t tell you that Mozart’s music is beautiful. But why not harm others? I asked. He tried to argue that harming someone would involve a practical contradiction based on Hans Hoppe’s argumentation ethics. This is the same argument used for self-ownership. But to disagree with the harm principle does not by itself involve doing any harm to someone. And disagreeing with the concept of self-ownership does render argumentation impossible. I greatly enjoyed my conversations with the professors throughout the week. However, I did not find myself converted by any of the economists. Unlike those who went from persecuting capitalists like Saul persecuted Christians, I must say I have had no similarly dramatic Road to Damascus conversion along the Road to Serfdom. It was not an uncommon question throughout the week by fellow attendees whether I was a “cradle free-marketer” or whether I came to the ideas after reading Atlas Strugged or watching Ron Paul videos. I reflected on my parents’ example. They are both entrepreneurs. They have worked from home my entire life. My dad worked in oil and gas before inventing a product. My mother has always been spontaneous and creative. I reflect on her taking me to garage sales a lot when I was young and encouraging me to barter. I recall having garage sales and selling lemonade and cookies. I also recall making my first “investment” at age 11 in a babysitting certificate program with a small loan that I would pay back to my mom with the income from my first couple of jobs. In my early teens, I had photographic business cards that I would give to parents after playing with their children at the park to drum up babysitting business. I recalled fundraising hundreds of dollars for the Terry Fox Run annually and going throughout my neighbourhood asking for donations after rehearsing my fundraising pitch with my dad. Throughout my whole life, my parents have been modelling entrepreneurship and encouraging creativity. Hearing so many socialist conversion stories had me counting my blessings. Working at the James Joyce Irish Pub led me to observe and reflect on what it takes to run a small business. I learned about how Anne and Gerard took a lot of risk, but had a clear goal to start the pub. Knowing their story and learning from how they ran their business meant that my part-time job was a lot more meaningful than I may have realized at the time. My experiences at Mises University were also a cause for reflection on what it meant to grow up in Calgary, Alberta. While among anarchists who resent patriotism and think all borders unnecessary and imaginary, I still could not help but realize that I am who I am because of the particular environment in which I grew up and now live. I found myself wanting to defend Canada, especially when the speakers would say that the Canadians have “some explaining to do” for all our socialism. We are more economically free than the United States now, I would say referring to Canada recently surpassing America in an Economic Freedom Index. Then, I would boast about Canadian federalism. How does the supposed power of the states in the U.S. compare to the provincial jurisdiction of healthcare and education in Canada now? I thought to myself: I’m not particularly patriotic, but suppose that I wanted to take some pride in my country. What is there of which I can or should be proud? Some of the best parts of Mises University were the conversations that I had with fellow students outside of the intense periods of scheduled lectures. One evening I had several particularly good conversations about Catholicism. (I am meeting so many young converts!) With a small group I discussed Plato, Aristotle, Augustine, Aquinas, Machiavelli, Rousseau, Hobbes, Dostoyevsky, Tocqueville, Nietzsche, Burke, Mises, Fulton Sheen, Russell Kirk, Leo Strauss, and others over the course of the evening. One young man with whom I spoke and who is converting to Catholicism from being a Baptist told the group that he has read Augustine’s City of God in its entirety and recommended it strongly to all of us. Another student who I met studies at Harvard and told me about his classes with Dr. Harvey Mansfield. “We spent fifteen minutes discussing the first words of the Republic,” he said. I smiled remembering that I too had had similar experiences being guided through the opening lines of Plato’s Gorgias (“War and Battle”) and of Plato’s Republic (“I went down”). My late-night conversations with these dedicated students was such a gift. I count myself blessed to have been in their company. On the final day of Mises University we had a barbecue dinner at the Institute. Everyone was outside, laughing, telling jokes, eating burgers and coleslaw and cookies. Several of the professors’ families, including many young children, had arrived for this final dinner. It was good to see. As everyone gathered around for the closing ceremonies, I cherished the experience. For a bunch of individualists, it seemed we hadn’t done too bad a job at being a community. 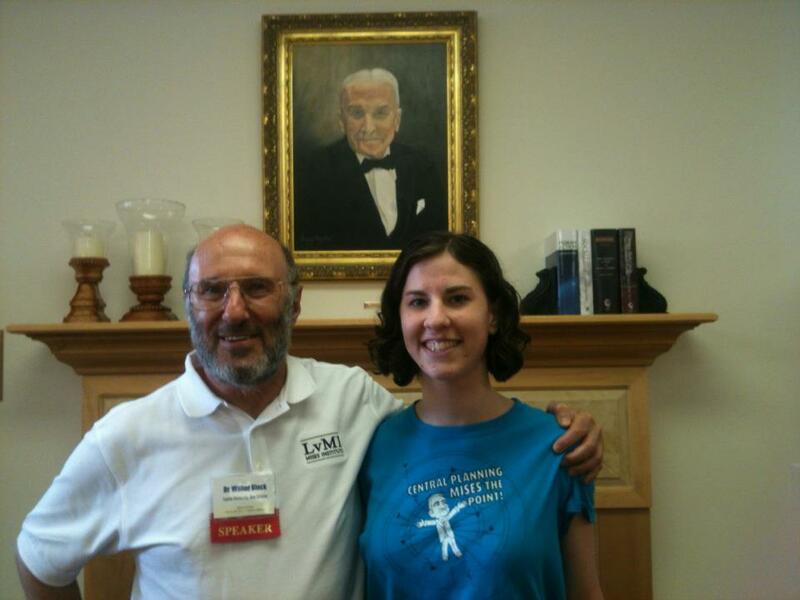 This blog is dedicated in gratitude to James Forward who sponsored my attendance at Mises University. This entry was posted in Conference, Economics, Opportunity, Ordered Liberty, Political Commentary, Travel, University and tagged Acton, Argumentation Ethics, Austrian School, Catholicism, China, Classics, Community, Cooper, Economics, Entrepreneurship, Hayek, Human Action, Liberal Arts, Markets, Menger, Mises, Mises University, Ordered Liberty, Philosophical Anthropology, Plato, Political Philosophy, Praxeology, Ron Paul, Samuel Gregg, Socrates, Travel, Voegelin, Walter Block by Amanda Achtman. Bookmark the permalink. Thanks for sharing! I’m applied to attend the Mises University this summer. Sounds like it was really beneficial. I stumbled across this post, and enjoyed it. It’s good to see fellow Catholics who are willing to engage the Austrian school. I do have to ask you though, why the opposition to anarcho-capitalism? I and many others hold that the each implies the other. I’m genuinely interested to hear your thoughts on this though. Perhaps you can tell me a bit about what you mean by anarcho-capitalism. That’s a hard question to answer, to be honest. I suppose what I mean is this: why must we have a state? If the free market is so great, why can’t it supply the services the state is suppose to, and do so without taxation, all the while operating as efficiently as possible while minimizing corruption?